Your Embassy can now be upgraded to Level 20! With each upgrade, the amount of Alliances you may hold will increase. You can have up to 40 Allies with a fully upgraded Embassy! Recall that Caravans and Reinforcements travel faster between Allied Castles, so having a wide network of Allies across Darkshine will give you a great advantage in both trade and military endeavors. 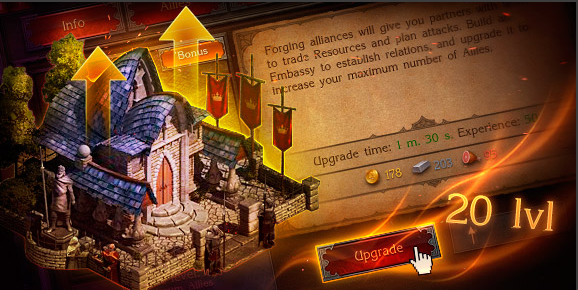 Furthermore, upgrading your Embassy will allow you to maximize the benefits of League Help. With each Embassy upgrade, more Lords and Ladies will be able to respond to your Help Requests (the building time is instantly reduced by a fraction with every Response). You will also increase the Maximum Building Time Reduction. This means that when you request Building Help, more League members will be able to accelerate the building process, and the total time by which building processes can be shortened will be increased as well. Develop your Embassy, and your Castle will prosper!